A proposed 33-story tower at the site of the former John Hancock Hotel & Conference Center would be simpler and more slender than its predecessor. 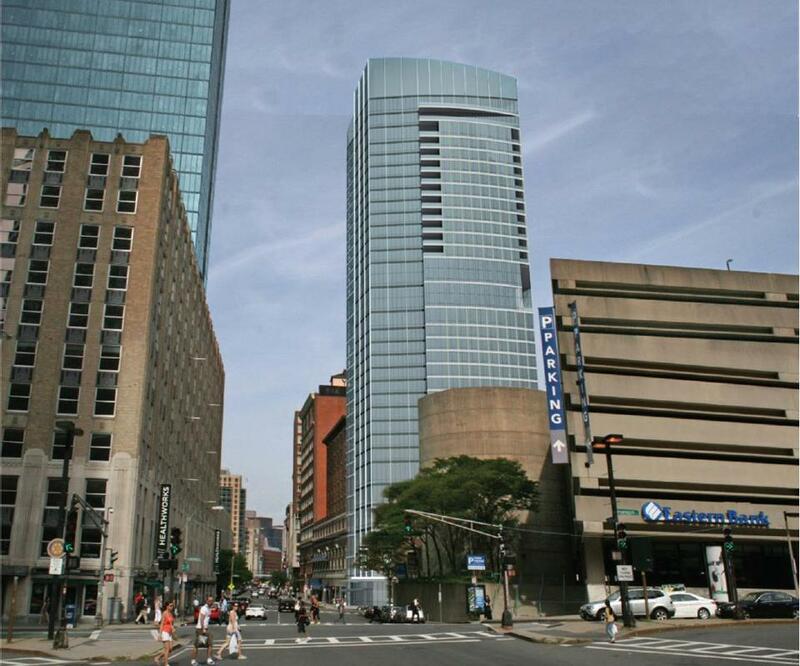 A Boston development team is pitching a revised design for its proposed 33-story tower at the site of the former John Hancock Hotel & Conference Center in the Back Bay. The newly re-shaped tower by The Architectural Team of Chelsea would be simpler and more slender than its predecessor, with gentle curvy lines juxtaposed against sharp angular faces. The building, at 40 Trinity Place, is planned to reach 400 feet in height, with a mix of hotel rooms, condominiums and three new restaurants. In a city filing released Wednesday, developer Trinity Stuart LLC -- a joint venture of Jordan Warshaw and hoteliers Jeffrey and Gary Saunders-- propose to reduce the number of condominiums from 142 to 115. They also want to combine the hotel’s function space and mid-sized restaurant into “sky lobbies” on the building’s upper floors. Trinity Stuart purchased the property in December 2011 from John Hancock Life Insurance Co., and has since been pursing plans for a towering redevelopment. The proposed project is among the largest in the city and would bring renewed activity to a perpetually dark corner of the Back Bay. Before construction can begin, the developers must get approvals from the Boston Redevelopment Authority, and other city and state agencies. The proposed building has a number of unusual design features, including the “sky lobby” atop the building that would incorporate a restaurant overlooking a three-season roof terrace. The main hotel lobby would be located on the 18th floor, with connected function and conference space on the 19th floor. Another restaurant will be located on the ground floor at the corner of Trinity and Stuart Streets. The hotel’s interior is being designed by Paul Taylor , the architect of New York’s NoMad, Ace and Crosby hotels. The Saunders Hotel Group owns and operates the Lenox Hotel, and the Saunders previously developed the Jury’s Hotel (now Loews Hotel), also located on Stuart Street in the Back Bay.